This is the RefinePro knowledge base about OpenRefine. We build it over the years, and keep adding to it. 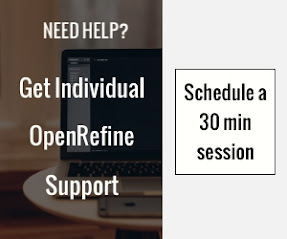 From great tutorials and how-to, to handy GREL expressions and links to external resources, you will find here one of the most comprehensive list of resources to learn OpenRefine. For a comprehensive documentation you should refer to the official OpenRefine wiki. Don't where to get started? Search for a specific function below, or read our most popular article from the right side menu. A look at OER-DISCUSS [Listserv] JISC CETIS MASHe: a complete tutorial to scrap data from a mailing list and analyse participant and contribution. A good review of faceting capability including text, numeric, timeline customized and scatterplot facet. Basic tutorial to clean up some date using OpenRefine. Great example of well structure GREL syntax to build complex transformation. Read the full article on Hermanes Barbara's blog. Following the results from the Google Refine Usage Survey, I would like to share a more personal vision of the birth of the OpenRefine community. The code and all issues have been recently moved to Github, the wiki will close soon and the project would have left the Google code environment. However while a clear consensus have been found to go for GitHub (GitHub got voted 35 out of 43 responses, see results here) to host the code and issue tracker, I am not sure that GitHub is the right place to for the documentation. In this post I'll try to explain the reason why. Please note that I am open to comments and suggestions regarding analysis and proposition I'll do in this post. OpenRefine is now within the community hands and everyone voice count. Following the Usage Survey (see first results), we open a survey to understand the community preference regarding tool to administrate OpenRefine. Thanks to the 43 participants. I blow provide a first flat analysis of the results with decision that have already been made based on this survey. You can access details answers here and the survey form here. Keith Maguire provide a list of short and sweet recipe to Capitalise the first letter, isolating value, faceted browsing or Comparing two columns with Refine. Enjoy! Following the survey on Google Refine usage we distribute last week I would like first thanks the 99 persons who participated. Thanks to your answer, we now have a better understanding of who use Google Refine, how and what's the community expectations are. Thanks again for spreading the word and providing detailed and insightful answers. Here is a first flat analysis of answer collected. You can access details answers here (email addresses have been removed) and the survey questions here. Yesterday David Huynh announced that Google will soon stop its active support of Google Refine and count of community to get more involved to growth Refine. Refine is already a mature data cleaning tool, this change in leadership will be a major challenge for the tool continuity. But first I'd like to clarify what I have read on twitter yesterday night. Google Refine has always been an open source tool and anyone can commit changes, develop an extension or update the wiki. Through this post I'd like to give my insight on the reason of this decision and what will be the short terms consequences of it. This neat tutorial explained how to import data directly from the twitter API at the project creation stage using JSON language. The second part of the tutorial explains how to prepare the data to import the in Gephi for data visualization purpose. PiratePad in french written during THATCamp Paris 2012 presenting a reflexion on how to use google refine or other tools to clean and work on data from a research worker perspective. Here is my work around. Access the github of the project. This extension is based on Chicago Tribune Stats extension. A tutorial is available on their blog. Please note that the extension does not work with Google Refine 2.5. It should be tested with the 2.0 version available here. If you have installed and tried any of those two extensions, I`ll be pleased to heard from you! Great tutorial to reshape data set using transpose and fill down function. This article also introduce the split multi-valued cells function to split and transpose in one shot. Count and perform basic operation in google refine? Yes, that's possible and we will see how. This article is a translation / adaptation of rechnen mig google refine published by cosmin on databeast.org. All images are from the original article. Entityhub RESTful API (see documentation). The Google Refine ReconciliationServiceApi allows to reconcile String values with Entities. The Entityhub is very well suited for implementing this service as it can execute those queries very efficiently based on the SolrYard implementation. An entry level and fun tutorial for data journalist or open data people covering all the mains aspects to clean a data set. The ready availability of data is leading to the increased opportunity of their re-use for new applications and for analyses. Most of these data are not necessarily in the format users want, are usually heterogeneous, and highly dynamic, and this necessitates data transformation eff orts to repurpose them. Interactive data transformation (IDT) tools are becoming easily available to lower these barriers to data transformation eff orts. This paper describes a principled way to capture data lineage of interactive data transformation processes. We provide a formal model of IDT, its mapping to a provenance representation, and its implementation and validation on Google Re fine. Provision of the data transformation process sequences allows assessment of data quality and ensures portability between IDT and other data transformation platforms. The proposed model showed a high level of coverage against a set of requirements used for evaluating systems that provide provenance management solutions. This article go through the step to transform an Excel document to Simple Knowledge Organization System Reference (SKOS) using the RDF extension. One of the nice thing about google refine is that every action you do generate a JSON code. If we want to do a comparison with Excel, the JSON code generated can be compared to record a macro. The sweet spot of Google Refine is that you don't need to click on the record button, it keep track of all your actions automatically and that can be easily exported for back up or editing purpose. Google Refine provide the row index as information in the third column. Unfortunately GREL expression cannot call value in this column, you need to use one of the following expression to generate the value. Google Refine sort function allow a combination of several columns to sort by field A and field B. In my case, I used this method as a work extract the most recent title posted from a records in a list of radio show (using a timestamp field). As I am not aware for a way to select a specific row within a record, I used the sort function to present the record I wanted to extract at the top my the record group. This short tutorial describe how to create records in Google Refine. For the difference between a row can present a data set in row or record mode (see the difference between the two). A complete example on how to use the RDF extension in google refine. By inadvertence one can transform quickly a field containing number in a text format to number format. This mainly happen during the project creation (import) or when creating new column. This conversion to number can lead to a loss of data like leading 0. Here is how to get them back and avoid this to happen again. Recently, Hugh Stimson published a great article: Data Mining My Old Radio Playlists. His post mix tutorials on php scripting, data cleaning with google refine and data analysis with PostgreSQL. This answer post demonstrate that data analysis is fully doable in google refine using really basic function (I'll be using GREL function only once for the long tail analysis). I guess also this post is a good illustration of my previous post on data exploration using google refine. How to enhance your data set with freebase and google refine.The Lawrence Collection example. The National Library of Ireland used google refine to improve the access to the Lawrence Collection (photography collection) by using freebase reconciliation service to map where pictures have been taken! When you want to map multiple items with the same location in Fusion Table, only one item is displayed and all the others are ignored. There is several workaround to this major limitation, and the most common is to change slightly your coordinate (longitude / latitude) so your point will appear close to each other on the map (tip from the google fusion team itself). When working with large data set, identifying and manually correcting all records sharing the same location can become time consuming. So I've been looking how to deal with this in Google refine and ends up with this straight forward process. Complete tuturial including, cleaning the data with grefine and visualization with Gephi. Free (and rebuild) the tweets! Export TwapperKeeper archives using Google Refine. So here's a way you can make a copy of a Twapper Keeper archive and rebuild the data using Google Refine. Google refine support regex. This online regular expression editor is quite handy to test the expression before using it on grefine. Google refine make a clear distinction between a row and a record. We will see what's the difference between the two and advantages to works in records mode. The fill down function consist to taking the content of a cells and copying down following blank cells. This is done based on the rows number. When you perform this action using the fill down function, Google refine does not take into account if rows belong to different records or not, if the following rows is blank, it will fill it down with the previous rows content. If you do not use this function with extra care you can easily corrupt the integrity of your data set. Here is why, and how to avoid that. See the documentation and the code on GitHub. Convert table pdf into csv. Good introduction to grefine to navigate and clean data. This tutorial explain how to populate species pages in the BDRS using Google refine. A JSON string is generated from a souce, parsed and cleaned in Google refine and exported back in JSON format. Nice introduction starts slide 12. Integrating Google Spreadsheet/Apps Script with Google Refine to update existing spreadsheet. Use grefine to get the data, clean them and then import them to a spreadsheet doc. This video tutorials show how to create a project in google refine 2.5 based on a online xml file. The full tutorial is available here. Visualisation on Top 100 Chemical Companies with Google Refine and Google Fusion Table.